Since 2006, the Global Gender Gap Report has tracked progress in closing gender gaps. Each year, the rate of change can estimate the time required to close the divide between women and men in employment, education, health and politics. 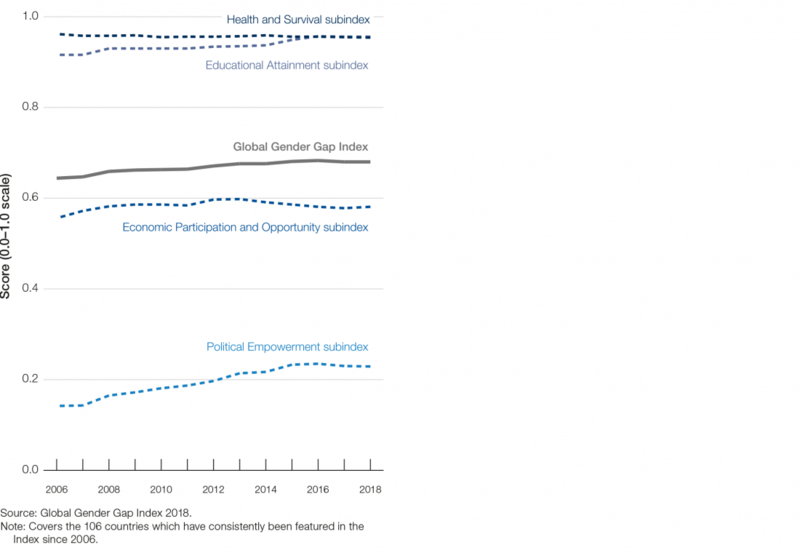 Figure 4 charts the evolution of the Global Gender Gap Index and its subindexes since the report’s first edition in 2006. Overall the gender gap has been reduced by 0.03% since last year and by 3.6% since 2006. All things being equal, with current trends, the overall global gender gap can be closed in 108 years. This is an increase of eight years compared to the estimate from last year’s edition, due to the extremely slow progress registered this year. As highlighted in the previous section, the gender gap’s size varies greatly across the four subindexes. These differences are reflected in the estimated timelines needed to close the four gaps. Economic Participation and Opportunity is the only gap that has shrunk this year, reducing by less than 1% over 2017 results and by approximately 2.5% since 2006. This year’s step forward has been driven by marginal improvements in women’s earned income and the presence of women among senior officials and technical workers, which have more than compensated marginal reversal in women’s participation in the labour force. Despite positive trends overall and in most of the underlying factors, the economic opportunity gender gap remains the dimension that will require the longest time to close completely. Based on today’s status and the trend observed over the past twelve years, it will now take 202 years to close the gap. The gender gap in Political Empowerment will also be difficult to close, and now requires another 107 years to be bridged. After having improved significantly over the past decade (+8.7%), it has reversed this year and now stands at a low 22.3%.17 Remarkably, the progress towards greater political representation has stalled in Western parliaments. Although these countries collectively have closed 41% of their women in parliament gender gap (versus the 29% global average), they took a step back this year. Progress is ongoing, however, in several non-Western countries, where, on average, an additional 1% gap among women in parliamentary postitions has been closed this year. Closing gender gaps in the remaining two subindexes is likely to happen much sooner. The education–specific gender gap, on current trends, can be fully closed in just 14 years. The global performance is virtually unchanged since last year, after having reduced by 4% since 2006. As highlighted in the analysis above, the gender gap has been closed on average by 96%; but to achieve full parity it will require bridging still large regional gaps and improve participation of both men and women in higher education in many countries. The time to close the Health and Survival gender gap remains undefined. Formally the smallest gap, it has remained substantially stable around over the years and can be considered virtually closed in most countries. However, it won’t be fully closed as long as specific issues remain in some of the largest, most populous countries (mainly China and India). Looking at regional differences, progress towards gender parity is proceeding at different rates across the eight geographic areas. Figure 5 tracks the evolution of the overall Index since 2006 by region. It highlights the progress towards gender parity made over the past decade in East Asia and the Pacific; Eastern Europe and Central Asia; North America; Western Europe; South Asia; Sub-Saharan Africa; Middle East and North Africa; and Latin America and the Caribbean. Six of the seven regional average scores improved over last year, and two registered a slight reversal. The most improved this year is Latin America and the Caribbean, with a progress of almost 0.6%, while the two regions taking a step-back are Sub-Saharan Africa (-0.6%) and South Asia (-0.2%). 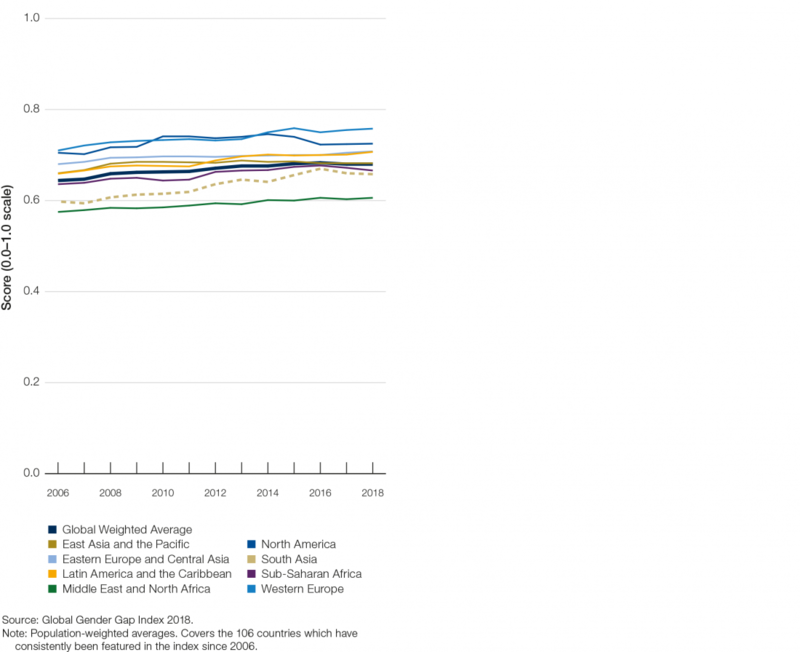 With current rates of progress, the overall global gender gap can be closed in 61 years in Western Europe, 70 years in South Asia, 74 years in Latin America and the Caribbean, 135 years in Sub-Saharan Africa, 124 years in Eastern Europe and Central Asia, 153 years in the Middle East and North Africa, 171 years in East Asia and the Pacific, and 165 years in North America. While these estimates reflect the pace observed to date towards achieving gender parity, policy-makers and other stakeholders can fast-forward this process through stronger actions. 17 Among the 106 economies tracked since 2006.